Moussa Dembele has declared that he had no regrets about the agitation that forced his Celtic exit. 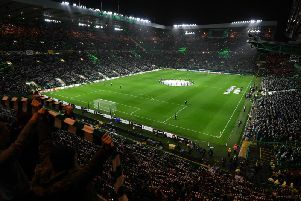 The France Under-21 international signed for Lyon late on transfer deadline day in a £19.7million deal after initially being told he could not leave because Celtic did not have a replacement lined up. The striker forced Celtic into a U-turn with a series of posts on social media that appeared to hit out at Brendan Rodgers, who sent him away from the training field on Friday because of his demeanour. Rodgers admitted his disappointment in Dembele’s actions and insisted he had to sanction the sale to protect the culture of his squad. But the 22-year-old felt the end justified the means. Quoted on L’Equipe following his first media conference as a Lyon player, Dembele said: “I was determined to come to Lyon, this is the option I wanted. But Celtic needed a replacement, well that’s the excuse they gave me. “We tried to find a solution, we did not succeed. But I was determined to come to Lyon and I let my bosses know and they gave in to let me go. Lyon president Jean-Michel Aulas claimed Dembele’s actions heightened his club’s determination to pull off the transfer. “We had to be flexible and smart to seal the negotiation at that stage of the transfer window,” he said. “Moussa is a real goalscorer. He is able to score from the head and both feet. He will bring power. We will need that, especially in the Champions League.